SEE END OF POST FOR UPDATES. 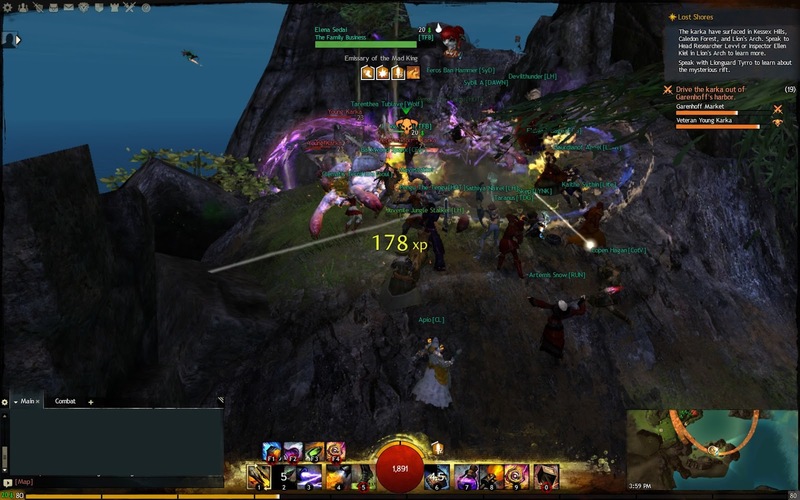 The first day of the weekend long event has started with the karka strike on Lions Arch. As we waited at the lighthouse, a giant sea monster, the Ancient Karka, launched out of the water, destroying a Black Lion Trading Co ship the process. After landing on the rocks above the shoreline, the creature summons a horde of lesser karka to attack the city. 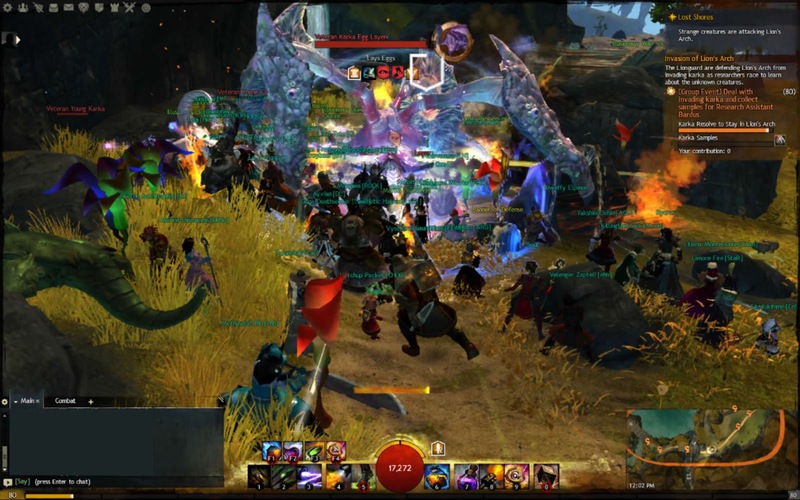 Hundreds of adventurers gathered at the southern coast of Lions Arch to push the karka threat back. They were met with a handful of egg-laying mother karka, who proceeded to give birth to many baby karka who were so small, and numbered so many that adventurers were hard pushed to keep the swarm back. 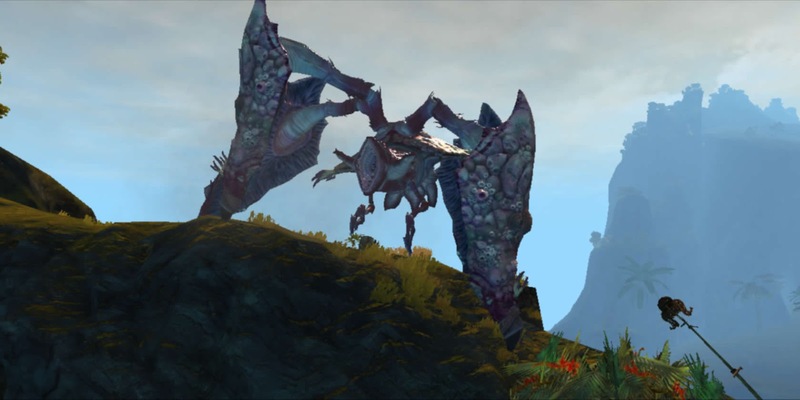 Karka attached themselves to limbs, biting and hindering the adventurers movements while they tried to defend against the veteran karka that were summoned to aid the egg-layers in their strike. During the battle, the biology team collected samples of the karka flesh as they slowly dropped, one after another. The battle was hard pushed, the egg-layers nearly invincible behind their thick armour. 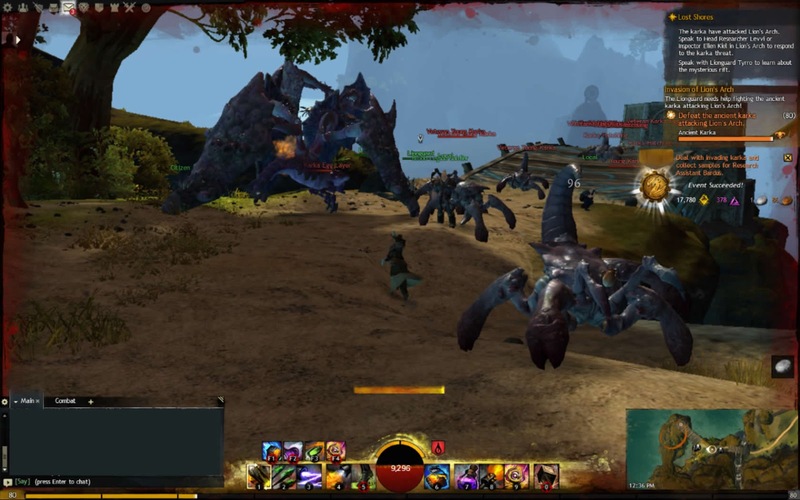 Many adventurers turned their attention to the lesser Karka aiding the egg-layers, until the karka lost their resolve to fight, giving up the attack and retreating back into the waters for the time being. Enraged by our resilience the Ancient Karka destroys the lighthouse in Lions Arch. Afterwards a tense peacefulness fulls upon Lions Arch, but not is all well. A call to arms is made to aid in the building of defences against the karka, and the research into the sea monsters, in the hopes that we might find a weakness to exploit. In the meantime, Tyrro of the Lionsguard investigates the Consortium and their strange asura gate that has torn an unstable rip in reality. Even though the battle was epic, an exciting event, the zone was so overrun with players that it causes the server to suffer from a severe input lag, meaning most players were forced to auto-attack the mobs when their activated abilities continously failed to proc. Many were even unable to heal themselves when the karka dropped AoE poisons. Karka have started to send waves of attacks against Morgan's Spiral in Caledan Forest. Meanwhile, aid is sort from the races of Tyria in various locations. Including defending the Largos in Viathan Lake (Kessex Hills) from Krait in order to win his loyalty, helping the Hylek Gukumatz create potions to weaken the karka in Michoan March (Metrica Province) and information is being sought from the Quaggans in Stormwreak Deeps for clues on how to deal with the karka threat. The Quaggans ask that we search the depths of the lake for clues to help in the fight. Unfortunately, many of these events appear to be a bit buggy at the moment, but hopefully in time the kinks will get sorted out and we will be able to proceed ahead with the events. The Karka have attacked Garrenhoof in Kessex Hills, but something suspicious is going on at the local wizards guild. Adventurers have been sent to confront Canach and discover what exactly he knows about the karka. Lag has also got so bad that enemy mobs to do show up at all now due to too many character models. Unfortunately the event is currently bugged on my server, along with several of the other events so I'm unable to provide details on the outcome of the event at this stage. Keep an eye on this post and following threads for updates, videos and screenshots as the day progresses.